An air tightness test measures the leakage rate of air through gaps, holes or cracks in the building. 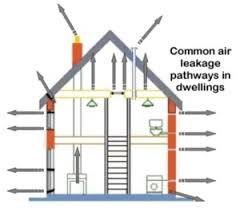 This leakage affects the buildings energy efficiency. 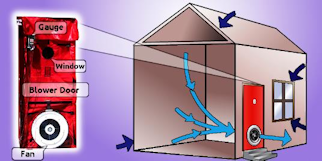 Air tightness tests are required before the sale of any newly constructed building regardless of the sale type. So this includes both private sales between two individuals and commercial properties. The pressure differential is measured across the building by using a large fan or number of fans which are installed temporally. All relevant openings into the property are temporally sealed and a range of pressure and environmental readings are taken. Then, with the fan switched on the air pressure is increased and/or reduced while tracking the pressure differential. Once issued a certificate is valid until any structural changes have taken place, i.e extensions or modifications to the property. Intermediate Floors - Use joist hangers where possible, if built into the walls seal with a flexible sealant.